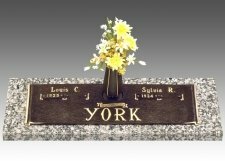 There is no doubt that there is a large variety of ways to memorialize a lost loved one, and this is, perhaps, what makes more than a few families feel intimidated when it comes to the final selection. It is very important to discuss the arrangements with the entire immediate family, and keep in consideration the wishes of the dearly departed. Needless to say, emotions can run high during this, understandably, difficult time, which can make the task all the more daunting. 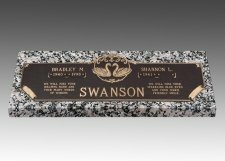 Actually, while many of the basic funeral arrangements must be arranged shortly after the passing, the selection of the final grave marker is usually one of the last to be worked through, and it is not uncommon for families to wait weeks, even months before actually purchasing the marker. 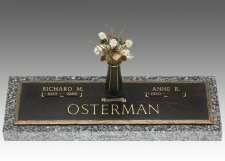 It is good to know what options are available for the memorial to be set, and many are not aware that purchasing a grave marker online is even possible, let alone very beneficial. 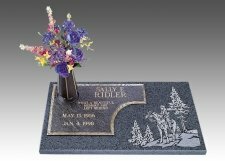 Our selection of specialty flush grave markers offers a number of beautiful individual and companion designs that feature, as the name implies, special themes. 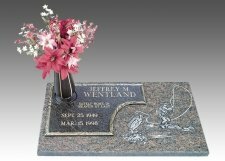 This selection of memorials is perfect for those looking to capture a certain interest, personality, or appearance. 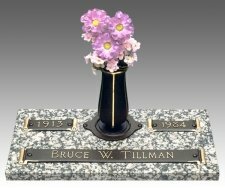 They combine bronze and granite to feature particular scenes, such a fisherman reeling in a big one, or a rider on horseback overlooking a beautiful valley – both elegantly carved into the granite, with complimenting cast bronze plaques to hold the name, date, and inscription information, as well as the optional flower vase. That is not to say all of the themes are so modern. There are several designs that feature a very traditional, yet distinctive appearance. One of the more popular traditional companion designs offered features a beautiful church in the vale, and includes two gorgeous colored ceramic photos. 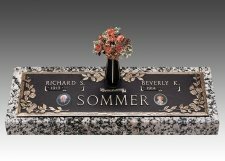 Any design selected will offer a variety of options to further personalize the memorial, such as a wide selection of bronze and granite colors, as well as lettering style and flower vase options, just to name a few. 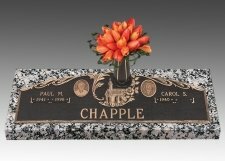 The addition of an emblem can add the perfect final touch to a beautiful and distinct memorial that will outlast the ages. 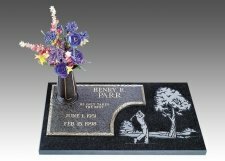 When it comes to selecting a memorial for a loved one, it is not as difficult as it may seem. The layout of the pages request direct and general information, which is easily submit from the comfort of one’s own home. This allows families to consider and decide upon the important details with comfort and ease. 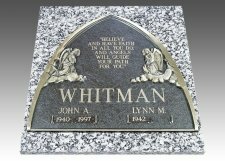 Just like with our other memorials, we confirm with the cemetery that the special theme of the memorial, as well as all other details, will abide by their regulation before creating the memorial. In fact, the memorial is not actually produced until the family sees a scaled down drawing, or layout, and approves the final design. The memorial will not only honor the life of the loved one, but will be a wonderfully personable tribute that will capture the personality of the departed, and share it with many future generations to come. 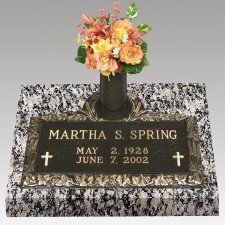 "I was pleased with the quality of the flag case, and the pedestal helps to completed the look. I couldn't find any seller close to the price (once you had to add in shipping, the brass plaque, and the engraving). The shipping speed was very fast. 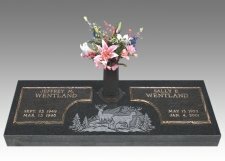 I would highly recommend Memorials.com. Thank you for the great selection, and for making a tough time a little easier. "